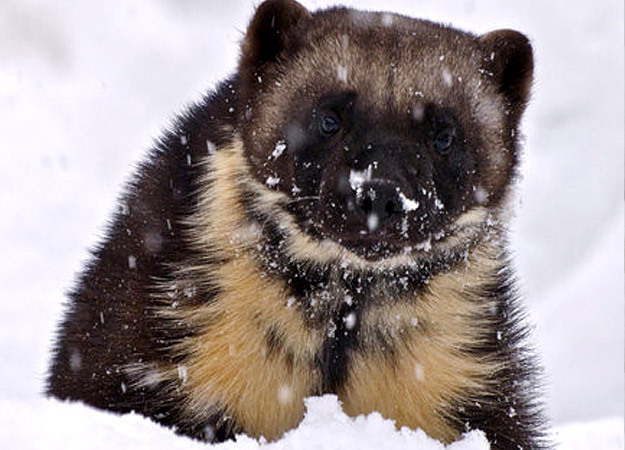 The wolverine is one of North America’s most formidable animal mountaineers. The largest member of the weasel family, the wolverine is stocky and muscular and looks like a small bear. It is perfectly equipped to live in snowy and mountainous regions with large five-towed paws that make it easy to move through deep snow and a thick, dark, oily fur that is resistant to frost. They have been spotted crossing high altitude passes at thirteen thousand feet (3,962 m). And they eat anything they can find — even if it’s frozen solid. They have a powerful sense of smell that can find a carcass buried twenty feet (6.1 m) beneath the snow, powerful jaws, and a special upper molar tooth in the back of the mouth, rotated ninety degrees toward the inside of the mouth, which allows them to tear off meat from prey that has been frozen.